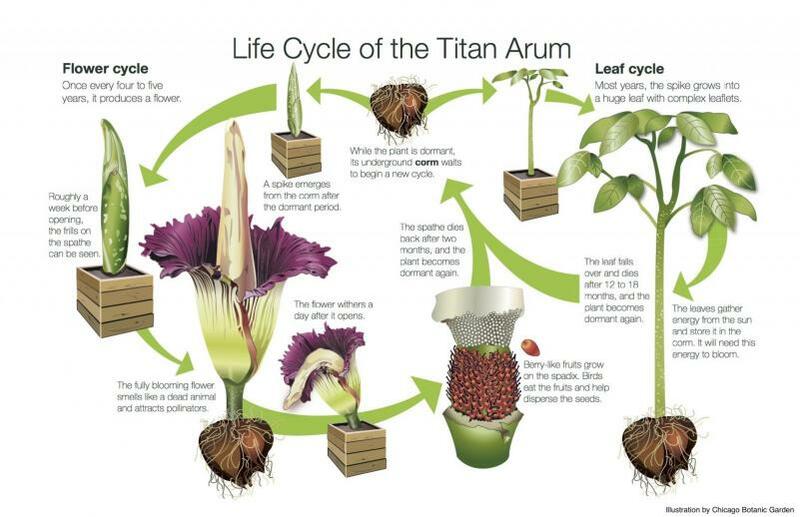 Three corpse flower (Amorphophallus titanum) plants, also known as titan arum or the stinky plant, bloomed in August 2017 at the U.S. Botanic Garden Conservatory. It was the first bloom for all three of the plants, which varied in age from five years up to 12 years old. This appears to be the first time in North America that an institution had three corpse flower plants all blooming at the same time. The three corpse flowers reached peak bloom on August 20, 22, and 28. The plants departed the USBG Conservatory for the Production Facility greenhouses on Wednesday, Sept. 6, 2017, where they will be cared for until they bloom again. The allure of the corpse flower comes from its great size (it is the largest unbranched inflorescence in the plant kingdom), powerful stink, and fleeting presence. When they went on display, the plants were between 2 and 3 feet tall, but they grew as tall as 8 feet 3.5 inches. Referred to as the corpse flower or stinky plant, its putrid smell is most potent during peak bloom at night into the early morning. The odor is often compared to the stench of rotting flesh. The inflorescence also generates heat, which allows the stench to travel further. This combination of heat and smell efficiently lures corpse-attracted pollinators, such as carrion beetles and flies, from across long distances. The corpse flower does not have an annual blooming cycle. The bloom emerges from, and energy is stored in, a huge underground stem called a "corm." The plant blooms only when sufficient energy is accumulated, making time between flowering unpredictable, spanning from a few years to more than a decade. It requires very special conditions, including warm day and night temperatures and high humidity, making botanic gardens well suited to support this strange plant outside of its natural range. This plant is native to the tropical rainforests of Sumatra, Indonesia, and first became known to science in 1878. In its natural habitat, the corpse flower can grow up to 12 feet tall. Public viewings of this unique plant have occurred a limited number of times in the United States. The U.S. Botanic Garden has displayed blooming corpse flowers in 2003, 2005, 2007, 2010, 2013, 2016, and 2017 (three blooms). We shared the 2016 plant's life cycle via a live webcam, which has now ended. In addition to this video from the morning it started opening, August 2, 2016, you can find all the live webcam videos on our YouTube channel. If you visited, find your date and see yourself with the corpse flower! 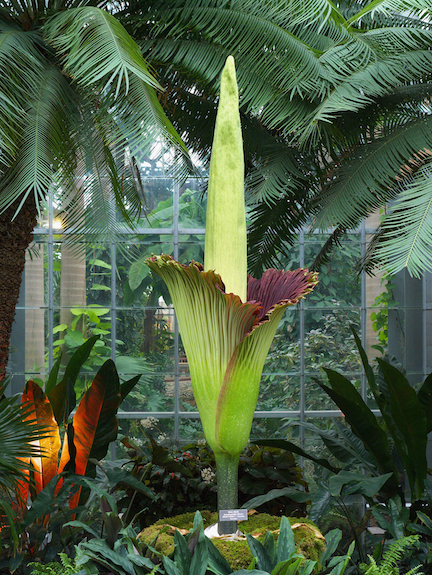 The U.S. Botanic Garden previously displayed a corpse flower bloom in 2016 and 2013. More than 130,000 people came to see the plant in person, and more than 650,000 viewers accessed the live webstream. Learn more about the 2016 bloom. Learn more about the 2013 bloom.